The Basil Magnolia Big Bell is a stylish bicycle bell that doesn’t impede your cycling. The practical display features no less than four stylish Basil Magnolia bubbles. The Basil Magnolia Big Bell is a striking choice of bicycle bell and easily attaches to the handlebar of your bike. This beautiful dark blue bell emits a loud dong sound that keeps you audible to other cyclists, pedestrians and motorists while you’re out and about. An essential for cyclists who need to get from A to B safely and in style. This bell is easy to use and makes a fine complement to bikes whose owners prefer something with plenty of character and colour. A diameter of no less than 80 millimetres makes it instantly visible and incredibly easy to use. If you’re serious about road safety and don’t want to settle for second-rate designs, the Basil Big Bell Magnolia is just for you. A great gift idea for cyclists you love and the perfect treat for yourself should you be looking to overhaul your bike accessories, this bell is bound to become a firm favourite. Browse for more bicycle bells, or check out further first-rate accessories online today at Basil. Suitable for most bicycle frame styles. 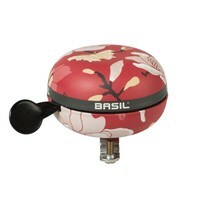 The Basil Big Bell Magnolia boasts a beautiful design and is easy to operate. Due to the clear dong sound, you’re always audible to other road users. This large bicycle bell is suitable for permanent attachment to the steering axis of your bicycle.